Victory Belt Publishing, 9781628602715, 384pp. 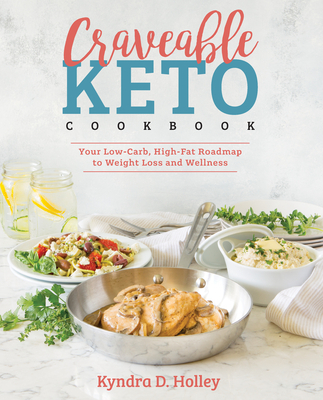 Kyndra Holley, the master behind the wildly popular food blog Peace, Love and Low Carb, brings together food, fun, and feeling fantastic in her new cookbook, Craveable Keto: Your Low-Carb, High-Fat Road Map to Weight Loss and Wellness. Each recipe has been perfected with Kyndra’s distinct flair for the flavorful and calls for ingredients that are low-carb, whole food–based, fresh, and easily accessible. With Craveable Keto, you will be able to effortlessly create quick, delectable dishes that taste like you spent hours on them. Break free from the food rut and embrace your inner master chef as you learn everything from how to stock the perfect low-carb/keto pantry to low-carb baking secrets. Complete with more than 130 whole-food recipes and detailed meal plans and shopping lists that make cooking keto a breeze, Craveable Keto is your ultimate guide to loving your low-carb life. Whether your goal is to lose weight loss, improve a health condition, or simply find food freedom, Kyndra will help you uncover true health, happiness, longevity, and the best possible you! Kyndra Holley is the face behind the keyboard at Peace, Love, and Low Carb. What started as a hobby blog and personal weight-loss journal now gets more than one million page views per month. Kyndra’s focus is on easy-to-make low-carb and gluten-free comfort food, and through her recipes and candid stories of her own struggles with weight, she has helped thousands of people lose weight and live healthier lives. Kyndra’s mission is to show people that a low-carb lifestyle is anything but boring and restrictive. When she is not in the kitchen working her food magic, she can often be found picking up heavy things and putting them back down, or playing with her five crazy pups. "In order to be successful in this lifestyle, delicious food that you enjoy is key! Kyndra’s healthy keto-friendly recipes will satisfy your taste buds. She is an ingenious master of bringing many things together into one cohesive and delicious cookbook that will quickly become a staple in your keto kitchen." "It’s rare to find a ketogenic book that so perfectly portrays how easy it is to eat this way every day. Craveable Keto Cookbook shows you how to spend less than fifteen minutes preparing your next high-fat meal with simple ingredients that you can find at any grocery store. This book is great for anyone who wants to streamline their standard ketogenic approach with uncomplicated recipe instruction, classic keto ingredients, and no-fuss food prep." "Who’s hungry? Well, even if you weren’t hungry before, you will be now. In Craveable Keto Cookbook, Kyndra brings her A game to the delicious world of keto cooking. These recipes are proof that you can give in to your cravings and still stick to your healthy low-carb diet."